Brand new Great quality 100% Cotton Sleeveless Denim Vest. These are slim fitted vests, Please read the measurements so that we can make sure you get the correct size: MEDIUM- chest 22 in length 30 in LARGE- chest 23.5 in length 31 in X-LARGE- chest 25 in length 32 in 2XL- chest 26 in length 33 in 3XL- chest 27 in length 33.5 in 4XL- chest 28 in length 34 in 5XL- chest 29 in length 35 in. 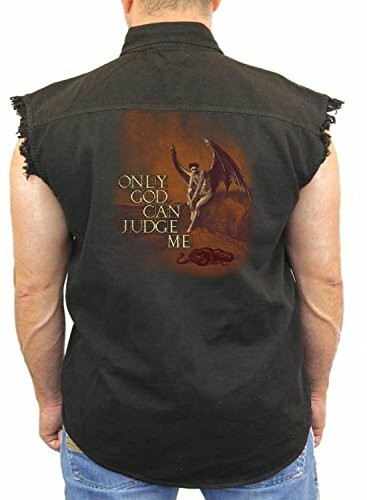 The vest comes with the design on the back.